In accordance with Waqf demands, Israel removes railings and scaffolding from entrance to Temple Mount. 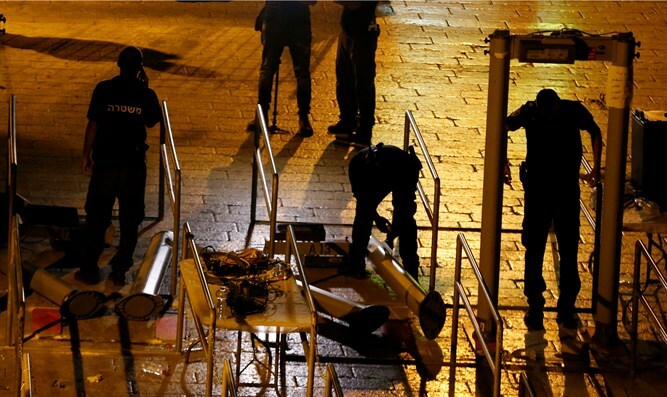 Israel on Wednesday removed more security installations from the entrance to the Temple Mount compound. Newly installed railings and scaffolding where cameras were previously mounted were removed from the entrance to the compound, according to AFP. The removal of the railings was one of the demands raised by the Jordanian Waqf to end the crisis. The Waqf also demanded that all eight entrances leading to the Al-Aqsa Mosque be opened in full, and that five more cameras overlooking the compound be removed as well. The security cameras themselves had already been removed earlier in the week, immediately after the Cabinet decided to remove the metal detectors that were placed at the entrance to the compound. Palestinian Arabs began to gather at the entrance to the Temple Mount on Wednesday night to celebrate the removal of the security measures, with whistling and constant horns from cars, reported AFP. Muslims have refused to enter the site and have prayed in the streets outside for more than a week after Israel installed the new security measures. The decision to impose these new security measures came after a terrorist attack on the compound in which two Druze police officers were murdered. Meanwhile, a poll released by Channel 2 News this week found that most Israelis do not support the decision to remove the security measures. When asked if removing the metal detectors was the right thing to do, 77% said the removal signaled Israel's surrender, and 17% said the removal did not mean Israel surrendered.